Amazing. Absolutely amazing. Impacting. A can't-get-it-out-of-your-mind-and-why-haven't-YOU-read-it-yet(?!) novel. 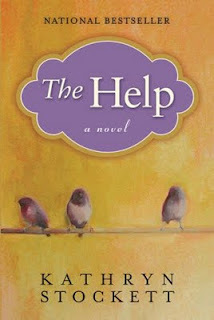 As I mentioned, a number of book bloggers read The Help and it received positive mentions. It seemed to be garnering a great deal of attention which is typically a cue for me to leave a book alone. (Yes, I am a rebel reader that way. If a book hits The New York Times bestseller list and "everyone" who is "anyone" is talking about it, I generally tend to ignore it. At least until the hype dies down.) Then it happened: my mother mentioned that she had read it and that she liked it. She even said it was . . . good. I had been waiting for the paperback version to come out but once she gave her approval, I looked it up on Amazon and discovered a hardback copy at a paperback price. I bit the bullet and ordered it. And do you know what? My mother was right. It was good. It is good. And I cannot get it out of my mind! Debut author Kathryn Stockett writes a compelling and moving story about black maids serving white Southern women in Jackson, Mississippi during the 1960's. The story revolves around four characters in particular. First there is Skeeter, a twenty-three year old white woman who wants to write a book about what it is like being a black maid to white families. Secondly, we get to know Aibileen who is a black maid/nanny who is raising her seventeenth white child. Thirdly, we meet Minny, another black maid who has a sassy mouth that gets her into heaps of trouble with her employers but who also made me generally laugh outloud at the way her voice was expressed in the story. Lastly, we fear and are repulsed by Hilly, a white woman with a big chip on her shoulder who is adamantly opposed to any idea of desegregation. Stockett tells her story through the first three women, devoting specific chapters to these specific women. For example, three chapters will involve the story of this secret book being written through the eyes of Skeeter. Then the following three chapters will give us the perspective of Aibileen who agrees to help Skeeter put together this book in hopes that it will bring about a change in the way that blacks and whites view each other. Then, of course, we hear about the world - and specifically Jackson, Mississippi society women - through the eyes of Minny who was my favorite character of them all. I loved her gumption, her spirit, her sassy/sarcastic mouth and the way of holding onto truth in the midst of a difficult life. The Help is a moving tribute, of sorts, to the lady who raised Stockett when her own biological mother was absent from the scene. When she was a young girl, Stockett didn't think to ask her maid what it was like to work for their family. She wrote this book as a question and answer session, of sorts, when thinking back. As difficult as the subject matter may sound, this book is beautifully written and extremely engaging. Skeeter is to be admired for her gumption to address an issue that most whites would (still) choose to ignore. You fear for her safety, you cheer for her successes and you wish her the best as she tries to do what she believes is right. Aibileen is admirable in every single way. Despite the injustices which are visited upon her, she remains calm, forgiving, well-thought out and a fabulous mother figure. You weep with her and you hope with her. Minny is a regular spit-fire who suffers the most injustices and yet also provides comedic relief. She has a tendency to speak her mind, even when it's not always in her best interest to do so, nor is it safe. But Stockett gives her mini "breaks" in her circumstances that make you sigh with relief and also feel an overwhelming sense of gratefulness, despite her troubles. I absolutely loved her character to bits! I do not feel that I'm able to write anything down in this post that will do this book justice. It was moving, endearing, eye-opening and thought-provoking. It made me wonder how many times I have spoken or acted in ignorance on this subject matter. It made me grateful that we have made so much progress as a country to accept those who look different from us on the outside. It haunted me when I think of how so many have suffered needlessly and unjustly at the hands of hate-filled men and women. I laughed, I hoped, I cheered and I feared for the characters as I read. It took me a good two weeks post-newborn to read this book but I was thoroughly engaged and moved by this story. I do hope more people give this book not just for entertainment purposes but because it reminds us that the color of one's skin should not dictate how another ought to be treated. As a mother to internationally adopted child, I find this message very relevant, since our own family is "mixed" as you might say. So far we have not had any negative experiences in this regards and everyone we know has been very supportive of us. We do get curious stares and questions from time to time, but nothing heartbreaking or negative - things that would most definitely have been expressed even just a few decades back. It is hard to wrap one's mind around that. I could ramble on but I'll stop there and simply say: find a copy and read it! I can't think but that you'll be glad that you did. I certainly am! I speculate that this one is going to end up as one of my top favorite reads of the year and the book now happily occupies space on my home bookshelf for future re-reads. Yes, I thought it was that good! I haven't read this yet. Hoping to do that soon, though. Oh, I loved "The Best Nest"! I've had some amazing email conversations with a Southern friend about this book. Ultimately, I thought the book was a true window on women: their compassion, loyalty, ugliness, and pain. Thanks for the recommendation! I requested it from my library but I think there are 6 holds in front of mine. lol They have 9 copies but it will still probably be awhile before I can get my hands on a copy. Glad you've joined in with the masses on this one...I heartily agree! I looooooved this book. Unlike you, I love to read/watch what's hot now because it's part of my blogging journey and because I think it's BIG clue into what is going on with our culture in the here and now. I think it's amazing how this book took off-peole are still seeking answers about this period in our history, and I think The Help offers them in ways that are telling, but not condemning. Great read and perfect for a book club. I really looking forward to the movie! I devoured this book. And I saw they're making a film version, which I will definitely go see! I had no idea there was a movie in the works. Not surprised though. Thanks for the tip!! I enjoyed this book as well. I grew up in North Carolina so I had to look at it from a Southerners view. I have the audio (18 hours!) on hold...and it looks like there is a LONG line with many audio books out there for this title. I'm tempted to just read it to savor it. Interesting. I tend to avoid fiction, popular books and books about this time period. But based on your recommendation I'll pick it up if I come across it this summer. I've tried it and put it down twice. I think that maybe I was just not in the mood for the cursing (it wasn't pervasive, but I remember that one character had a particularly vile mouth) or the subject matter at the time. I do intend to pick it up again, though. Oh my goodness, I LOVED this book! It sat on my shelf a year before I finally worked it in to my reading schedule and WOW! I can't believe I waded through some mediocre books before hitting this pot of gold. :D Glad you enjoyed it, I really liked it too! Not sure it's a "re-read" but I really enjoyed it when I read it a few months back. I am the exact same way, I tend to rebel against whatever is the hot popular book of the time. But I also loved this one. The Potato-Peel Society book was another one like that for me, I held off on reading it for some silly reason but then really liked it when I did. I nabbed a brand new looking hard cover copy of this book at my library for a couple dollars. I'd say the best two bucks I ever spend! This was a "highly recommend" book on my review too. I loved this story. So glad you finally read it. Uhm, that would be "spent". Sheesh. I need to get my spell groove on. LOL. When I finish a book, I immediately start another one. I can't stand not to be reading something. The Help is an exception to that rule. I couldn't get it out of my head. It was probably three days or so before I could read anything else. I love it! It's such a great book. I completely agree. Amazing book. I "read" it in audiobook form and it was very, very well done. I'm so glad you have read this book! I would definitely say it is one of the best I've ever read. I also shy away from popular books, unless recommended by certain friends I can trust to steer me in the right direction. But this one, WOW! And I hope the movie is as good. One of my favorites! So glad you enjoyed it as well! I'm in the middle of listening to this on my MP3 player. Love it!! I'm far from finished, but enjoying every bit of it and can totally relate to all that you have to say about the story and the characters. Minnie is wonderful, isn't she?? I know so many bloggers are reading/have read this book, and after seeing the movie preview I was extremely curious. I thought, "Maybe Carrie reviewed it!" And you did, and I'm glad, because now I'm adding this to my list. :) I usually don't read the most "in" books either, but this does sound like a good one.